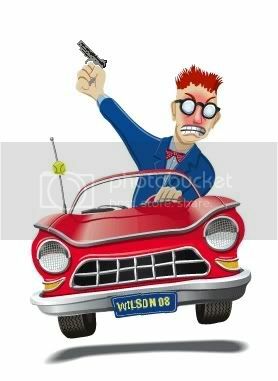 Driving to my work place, once I was witness to a road rage, which is sort of common conflicts happening every day in major cities like Tehran. A youth driver was maneuvering in the highway regardless other motorists, listening to a laud, irritating rock music. Never before an old man complained, honking his horn, had I seen such a rude and disrespectful manner. The young fellow gave the man his finger, holding his left arm in the air out of his car's window. His gesture was enough to make a carefree person mad. Let alone a respectable decent old man. Surprisingly, the old guy did not take it slightly! And sped up chasing the young man. So there they were, racing in the highway, disturbing other drivers, shouting and insulting about and nerving themselves for a confrontation! In my view, on no circumstances did they have the right to mess the highway up and the young guy was the main culprit of this messy situation. Finally, the old man stopped the fellow, rubbing his car to the young guy's. And they continued their foolishness out of their cars, rowing over nothing! People, who had been watching this happening, mostly stopped by to enjoy a nice rage! regardless of the traffic increasing at their back. Hi, Mahdi: Well, road rage is surely an international issue. What may cause it? Where was the police? Why they didn't stop them? philosophically speaking, it should happen in order to challenge your mind for asking these questions.i sympathize with you by the sight of these problems.and i appreciate you in using some new words from the "VOCABULARY" book such as culprit, rage,... what do you ask then if you see two couples fight and hit each other in the street. i asked the same question exactly by the sight of this scene some times ago. a man hitting a woman in front of 1000 eyes. I think every thing may cause a rage. from color of cars in the street to economic problems like inflation!!! So, it's really difficult to find the main cause. Instead of that, people should learn how to control they anger!